I was excited to try this cereal. Cinnamon Life cereal has a firm hold on the #2 spot in my list of favorite cereals. I was ready to shake up my top five to fit in this new cereal. Unfortunately, Vanilla Yogurt Crunch Life comes closer to my bottom five favorite cereals than my top five. The problem is with the "crunchy oat clusters covered with creamy vanilla flavored yogurt". The main cereal pieces (or "Life biscuits" as they're called on the box) are relatively unchanged: same great shape; same unique milk absorption; and same basic Life flavor. I wish I liked the yogurt oat clusters because there's quite a few of them (especially when compared to similar new cereals). But the hard fact is that they taste kind of musty... kind of old. This is a harsh comparison I know, but they have the spirit of mothballs. They're sweet. I'll give them that. But there's something just a little off about them and the flavor (which is very short on vanilla by the way) gets infused into the "biscuits". My morning bowl of Vanilla Yogurt Crunch Life tasted as if the box had been left open in my pantry for months. Let this be no reflection on the texture. The "clusters" do maintain their promised crunch and the "biscuits" are what we're used to. My complaint is strictly a flavor issue. I had a friend try some of this new cereal. She liked it at first and said, "I like it's perfect light amount of sweetness. I like the yogurt clusters. They taste... nutty." With no prodding from Mr Breakfast, a few bites later she said, "But there's something weird about them." In the case of this new cereal, you'd be better off taking original Life cereal and adding your own yogurt covered raisins or nuts. 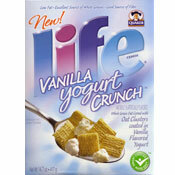 What do you think of Vanilla Yogurt Crunch Life? This is my son's all-time favorite cereal. But... I can't find it anywhere anymore. Please help me find it again! They disc it :( I miss it. I love this cereal!!! Please help. Where can I find it? I've looked everywhere! I saw this product and tried it and it was awesome, now I cant find it anywhere. I have tried all the stores in my area and cant find it. Then I'm a true Life cereal I like all of them. Where can I find this cereal?? What I didn't like about the yogurt clusters was the slightly waxy feeling they left in my mouth after eating them. EW. I can't believe people don't like this cereal. It's all I've been eating for breakfast for months now. i am not a fan of regular Life Cereal, but I love how the delicious vanilla yogurt bites break up the monotony. The bites have a little bite to them; I believe this is because they are made from yogurt. 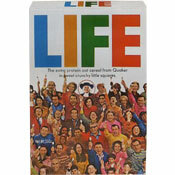 eh, not my favorite Life cereal but i enjoyed it. I took two bites of this seriously and then tried to pass of the two (two for one special) boxes off on my neighbors who also tried it and declined. I bet the rats wouldn't even eat this crap! regular and cinnamon life fine, but vanilla yogurt needs to stay in the cup, thank you.